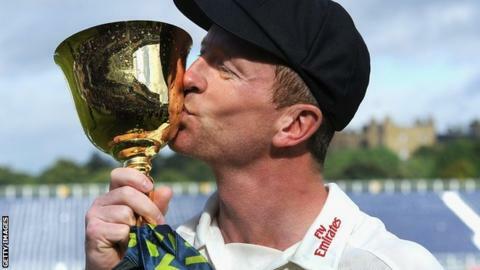 Durham captain Paul Collingwood wants to "savour" what may be his last season in professional cricket by bringing more silverware to the north east. Collingwood, 37, 17 years after his first-class debut, and is entering the final year of a three-year deal. "You want to put in the big performances and go out on a real high," Collingwood told BBC Newcastle. "The goal is to win things with this team but also contribute runs." He added: "It's a really exciting time, with the talent we've got in the team I'm sure we'll see more international honours." After progressing through the academy ranks at Durham, Collingwood forged an impressive career with both county and country, making his England Test bow in 2003. At any time you want to enjoy what you do and I've been privileged to do this for a long time and I've enjoyed it. He was an Ashes winner in 2005 and 2009, World Twenty20 title-winning captain of the England side in 2010 and named one of Wisden's Cricketers of the Year in 2007. The Shotley Bridge-born player spent the winter working with Scotland, whom he helped to the World Cup along with Craig Wright last winter, and England for whom he worked as assistant to Ashley Giles. Coaching and an inevitable flood of media work will likely follow when Collingwood does decide to retire but until the final ball is bowled, the former England one-day captain is focused on Durham's success. "It's been enjoyable [coaching] but now it's back to normal stuff and another big summer for us," Collingwood continued. "At any time you want to enjoy what you do and I've been privileged to do this for a long time and I've enjoyed it. "When something is closing to an end you want to enjoy it even more and savour every moment."